Introduction: We present a laparoscopic training program for the developing world that emphasizes safety and sustainability, which has been successfully implemented in two countries. This is to counter significant barriers to the adoption of laparoscopic cholecystectomy, including the local infrastructure, the high cost of laparoscopic equipment, lack of skilled preceptors, and concerns regarding the safety of these operations in inexperienced trainees. Methods: A laparoscopic cholecystectomy training program was developed by the surgical staff at Bassett Healthcare in Cooperstown, NY, and executed in the Dominican Republic and in Anguilla. The program was conceived and executed in three phases. Phase one included scouting potential locations to assess sustainability and to determine the commitment and ability of local surgeons. Phase two was carried out over five days and included a day of didactic sessions, practicing on a low cost laparoscopic trainer, and a series of preceptored cases. Phase three was a repeat trip 4-6 weeks after the initial training to trouble-shoot. Equipment was donated from the hospital as well as industry sponsors. Careful consideration was given to issues of sustainability, and disposables were kept at a minimum. Local surgeons completed proctored cases with the goal of having them operate independently. Patient data was collected to track outcomes. Results: Thirty-one laparoscopic cholecystectomies were performed under the auspices of this program. Twelve were completed independently by the local surgeons since the implementation of the program. Of these 12, the median length of stay was 8 hours. There were no conversions to open, bile duct injuries, or deaths in this series. Both programs are still in operation 18 and 9 months after our last visit. 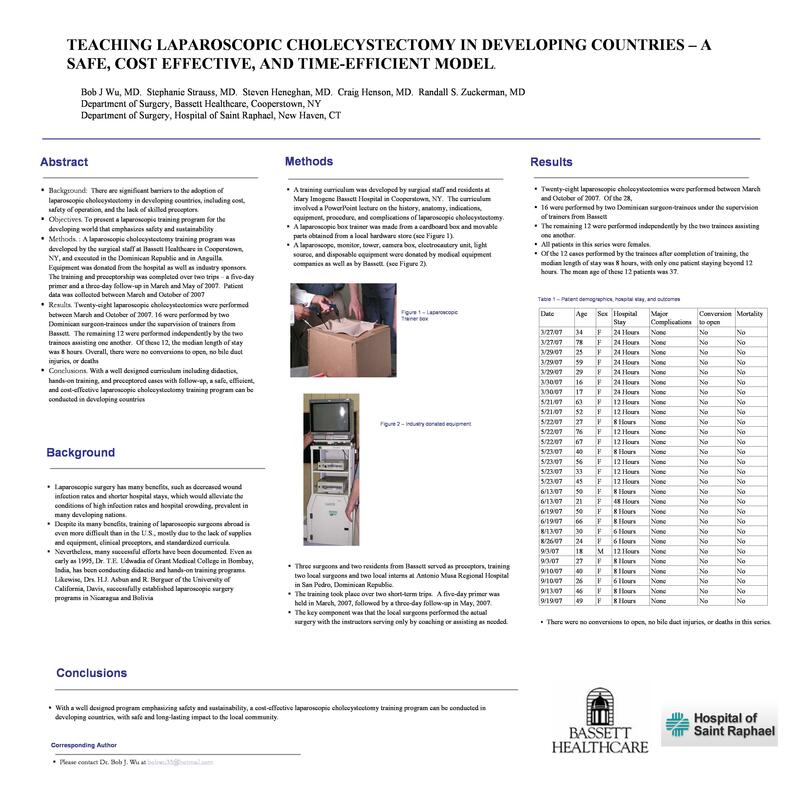 Conclusion: With a well designed program emphasizing safety and sustainability, a cost-effective laparoscopic cholecystectomy training program can be conducted in developing countries, with safe and long-lasting impact to the local community.